The WST Learning Community offers programs addressing academic and professional issues for women students. Typically, it includes 48 students living in Stein and Goldin Houses (4th St. Apartments A and B), who connect with one another and faculty through monthly dinners, bi-weekly lunches, campus receptions, and research panels. 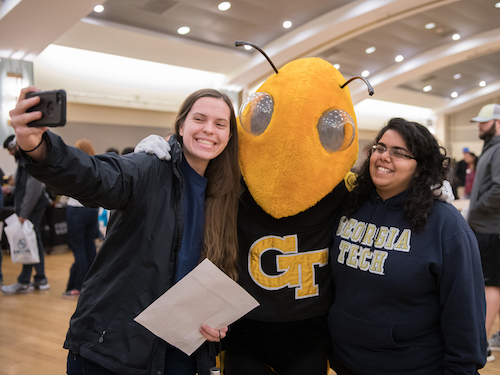 All Georgia Tech students and WST mentors are welcome to attend WST Learning Community events. WST Learning Community residents may also be paired with a faculty/staff mentor (optional). WST also sponsors undergraduate research partnerships for WST Learning Community students. WST Learning Community residents are required to attend WST Learning Community orientation. In addition, each student must attend five WST or Learning Community events and/or meetings with a WST mentor each term. Each WST Learning Community member is expected to serve on a WST Learning Community committee. Applications to live in the WST Learning Community in 2019-20 are due February 15, 2019, and after that will be accepted on space available basis. A paper application for the WST Learning Community is also available. WST Learning Community Orientation: Held the first week of fall term. Monthly dinners: Held in Stein House, featuring guest speakers, and open to all Georgia Tech students and WST mentors. Past speakers have included faculty, administrators, professionals, and alumni who share their career interests and paths. Other popular topics have included career strategies, resume writing, interviewing, and graduate/professional schools. Occasional lunches: Held on campus at various locations and open (space permitting) to all Georgia Tech students. 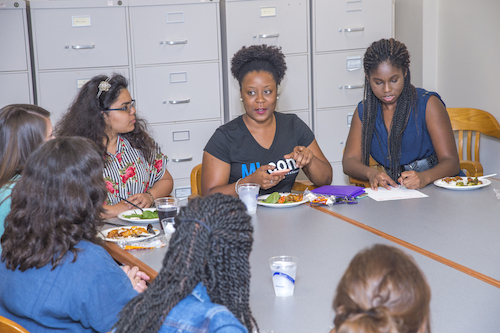 Some lunches are small (two to five students), with a faculty host, while others are larger and focus on topics of broad interest (graduate fellowships, study abroad, etc.). Each term one or two lunches bring together students in a particular major; these may be co-sponsored by an academic unit. WST Center events: Approximately two to three per term, open to all faculty, staff, and students. Regular events include an annual fall reception, WST-focused research panels, and the WST Distinguished Lecture. WST Learning Community Mentors: Interested WST Learning Community students are paired with a female faculty/staff mentor in a closely related discipline. Humanities elective course: Taught each semester by Dr. Colatrella in Stein study lounge. Coffee hour: Held in WST office in Stein before Dr. Colatrella's class or by appointment. WST GRA office hours: Each WST graduate partner holds a weekly office hour in the WST office in Stein. Initiatives/events coordinated by WST Learning Community hall director/RAs: These include hall meetings and periodic "Treat Yourself Tuesdays," with social hour, arts and crafts, yoga, and more. Each committee will select a chairperson to represent its views and decisions to the steering committee. The steering committee will meet with the Hall Director as needed to ensure funding and follow through. The chairperson will be the liaison communicating with residents, WST Team, Hall Director, and RAs. Responsibility: Reach out to women students to participate in events and initiatives. Responsibility: Work with the Hall Director and WST co-director to plan a program focusing on career planning. Tuesdays, 3:45pm, Inman Middle School, Virginia Ave.). Plan additional service and study related events.